A felon with a loaded firearm fled police through a Grover Beach residential neighborhood on Saturday. Officers eventually arrested the man and found his gun in a woman’s backyard. Around 10:44 a.m., Grover Beach officers responded to the area of 13th Street and Highland Way to check the welfare of a man lying on the sidewalk. 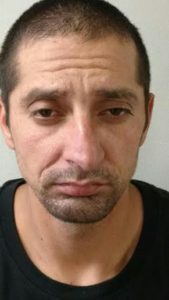 When the officers arrived, Joseph Martin Chavez, 35, from Guadalupe took off and jumped multiple fences, according to the Grover Beach Police Department. Officers established a perimeter and and later contacted Chavez as he was walking at the corner of S. 14th Street and Baden Avenue. Police took Chavez into custody. Shortly later, a resident called to report finding a sweatshirt in her yard with a firearm inside. 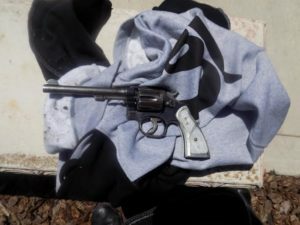 The gun was loaded, and officers determined both the firearm and sweatshirt belonged to Chavez. Police charged Chavez with having to outstanding warrants, being a felon in possession of a firearm, resisting arrest, providing a false name and violating probation. Officers booked him into the San Luis Obispo County Jail. Chavez remains in jail with his bail set at $70,000. Arroyo Grande police and San Luis Obispo County Sheriff’s deputies helped Grover Beach police make the arrest. Oh gee. From Sanctuary City Guadalupe. Who would have ever guessed. OMG why are you guys so cynical? He totally looks like Grover Beach neighborhood watch. I am sure he was taking a nap on the sidewalk. Good sidewalk in Grover is hard to find. Another loser, sucking us dry. Appears he won’t meet life expectancy at the rate he’s going. Imagine that! Yet another felon in possession of a firearm…and so it goes. Do online newspapers not have editors?